This would be your Dentists first choice of crown material due to its superior quality and highly cosmetic appearance. Lava crowns are metal free (100% porcelain) and have a 5 year guarantee. 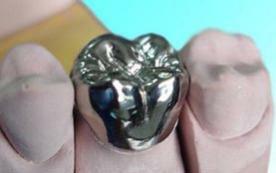 Strong crown consisting of porcelain outer layer bonded to an inner metal core. Colour-matched to patient’s tooth. METAL CROWN GOLD OR SILVER COLOUREDBasic gold or silver coloured crown for molar teeth. Available on the NHS.